When a young woman’s body is found in a rubbish dump Inspector Silvio Montalbano and his team are at first baffled. Her face has been severely damaged so the only identifying feature they have to go on is a tattoo of what appears to be a butterfly on her shoulder and Montalbano uses his friends in the local media to publicise this and try to drum up some information. Eventually the team is led to a charitable organisation in which things are not always what they appear to be. I read my first Camilleri novel only last year and while I liked it, I did not fall in love with its protagonist as so many other readers have done. However on my second meeting with this character and his environment I am well and truly smitten. This is, quite simply, a delightfully concise book full of humour and warmth and I revelled in its myriad of little joys that felt like they were hidden just for me. Montalbano is once again worried about his advancing years but whereas this annoyed me a little in the previous book here I found it amusing and at times even poignant. The depiction of two Montalbanos inside his head who argue with each other about his motivations and behaviour is priceless (and relief-inducing because it’s nice to know I’m not the only one who hears such voices). He is also experiencing some difficulties with his long-time love interest Livia but he doesn’t let this get in the way of his investigating. Well not much anyway. In the end he wades through all these personal problems, stands up to the ever-present political and business interests who try to influence his work and even untangles all the wrongly transcribed messages from his devoted but fairly useless desk sergeant Catarella to solve the crime with intelligence and a dash of panache. Much of the enjoyment in the book stems from the word play and language games with which the book is littered; a testament both to Camilleri and his translator Stephen Sartarelli. I cannot think of any aspect of translation that would be more difficult to get right than the range of both obvious and subtle humour on display here. But the book is not all laughter and lightness; alongside the almost slapstick moments such as a police department which can’t afford petrol for its cars there are touching elements too like Montalbano’s growing intolerance for the death he is confronted with in his work and on his television screen. I read this book in not much more than a single sitting and enjoyed every minute of it. The implausible but nevertheless compelling set pieces, the seriousness with which Montalbano treats lunch and the brilliant depiction of local life and customs are a welcome treat. In the middle of a cold and gloomy winter you can’t ask for much more than a book which puts a smile on your face for several days. This is one of seven books nominated for this year’s International Dagger award for translated crime fiction which will be announced later this month. So far I have read Anders Roslund & Borge Hellstrom’s Three Seconds, Ernesto Mallo’s Needle in a Haystack, Fred Vargas’ An Uncertain Place and Valerio Varesi’s River of Shadows. I have Domingo Villar’s Death on a Galician Shore and Jean-Francois Parot’s The Saint-Florentin Murders still to read. I’ve got both on my eReader and will definitely read the Villar but haven’t yet decided on the Parot – it sounds a bit heavy-going for someone who hasn’t read any of the earlier books in the series. This entry was posted in Andrea Camilleri, book review, Italy. Bookmark the permalink. Glad you enjoyed this, Bernadette, Camilleri is somewhat special, maybe because he was well and truly matured before he began to write 😉 The translation is lovely, too, as you say, so inventive and erudite (notes in back). On the Int Dagger, the Perot is the only one I have not read. I probably shan’t read it but have downloaded the first book in the series as it was 99p, so I may read that at least to get a flavour of the author. I think it was Laura Root (who has reviewed some or all of the series for Euro Crime) who said that the first one is the best. Bernadette – Oh, I like Montalbano very much myself, and I am so glad you did, too :-)! You’re quite right as well that it’s incredibly difficult to convey subtle (and even not-so-subtle) humour effectively, especially in a translation, but as you say, Camilleri and Sartarelli do so very, very well. And I really like some of the regular characters such as Fazio and of course Catarella. They add richness to the stories. Technically I´ve been reading it for two days, but I´ve got to page 13. Bernadette, I am so pleased you are now smitten with Camilleri. One of the things I like about the Montalbano books is that he always leaves you wanting more, unlike those authors who go on and on with page after page of turgid prose. Sorry Anonymous was me! I must have forgotten to fill in the form at the bottom. Great review! I agree with every word of it. I so enjoy spending an afternoon or two in Vigata with Montalbano and his cast of characters. It is escapism, diversion, entertainment, while (for me anyway) providing a virtual vacation. Sartarelli’s translation and end notes are wonderful. (By the way, he laughs out loud while he’s translating as so much is hilarious.) It’s also a virtual gourmet experience as Montalbano is always remembering a great meal, eating one or thinking of the next one. I have now read 7 of these and have 6 to go. There’s another one coming. I purchased the books not available in my library and am trying to save the one I have left until I finish needed tasks. But I have a feeling I’ll cave. It’s just too tempting. 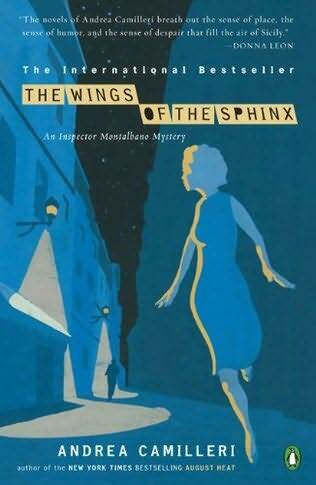 There is nothing like sitting down with a book in this series and spending time with Montalbano and his colleagues. They are gems. And I think I’ll be rereading several after I finish the series.